I am excited. The Big Man and a living legend is going to be on heard on TORi this Sunday – on the 3rd Anniversary show of Durga’s Patala Pallaki program. The show is on TORi Classic channels – at channels’ local time 12 noon. Please tune in. Hi Everyone, Finally I have edited and sent the 3rd anniversary of Patalapallaki Special Program, the interview with the great actor of Telugu Movie Field, Shri Akkineni Nageshwar Rao garu to TORI, which is going to airon this coming Sunday, Sept. 25th, at 12pm on Teluguoneradio.com . Please do not forget to listen and leave your comments after listening as it was my lifelong dream,I’ll appreciate it! Could you post the interview please when you get a chance. Will do andi. later today or tomorrow. I am heartened to know all the positive feedback on this interview. Great job Durga garu. I will make this interview available as a podcast in a week. Thank you so much for your encouraging comments. Thanks a lot for all your help without which all this was not at all possible. I really mean it! చాలా చాలా బాగుంది మీ పరిచయ కార్యక్రమం. మీలోని తృష్ణ మీ ప్రశ్నల రూపంలో బాగా కనిపించింది. మీరు దీని వెనుక చేసిన కృషి అమోఘం అభినందనీయం. సమయం గడిచిందా అని కాదు ఇచ్చిన సమయాన్ని ఎంత సద్వినియోగం చేసాము అన్నది ముఖ్యం. నాగేశ్వరరావు గారి గురించి ఏమి చెబుతాము ? ఎప్పుడూ నేర్చుకోవాల్సిందే ఆయన నుండి, నిష్కర్షగా ఆయన చెప్పిన సమాధానాలు ప్రతి ఒక్కరికి ఆచరనీయమే. ధన్యవాదాలు దుర్గ గారు, ఇంత మంచి కార్యక్రమాన్ని మాకు వినిపించినందుకు. శ్రోతలు ఎలా స్పందిస్తారో అనే కొంచం కంగారు నాకు వచ్చే కామెంట్స్ చూసి పోయిందండి. నాగేశ్వరరావు గారితో మాట్లాడుతుంటే సమయమే తెలియలేదు. ఆయన కూడా త్వరగా భార్యను చూడడానికి వెళ్ళాలి అని ఇంటర్వ్యూ పూర్తి అయ్యేదాక చెప్పలేదు, అదీ్ నేను అడిగినందుకు చెప్పారు. ఆయన అలా చమత్కారంగా, నవ్వుతూ బోలేడన్నీ విషయాలు చెబుతుంటే ఇంటర్వ్యూ అయిపోవస్తుండగా అయ్యో అప్పుడే అయిపోవచ్చిందే అనిపించింది. మీరన్నట్టు ఆయన దగ్గరనుండి నేర్చుకోవాల్సిన విషయాలు ఎప్పటికీ, ఎన్నో వుంటాయండి. ప్రోగ్రాం మీరు విన్నందుకు, నచ్చినందుకు ధన్యవాదాలు. hi, you have done excellent interview of Akkineni nageshwararao. when you raised a question why young generation is not having attachment with telugu, he observed that children need to speak in telugu or mother tongue as the pregnent mother talking with infant has influence on the infant in stomach, like by his analogy of abhimanyu in womb of mother when listening to arjuna talking about chakravyga getting in that imprints the infants mind, is indeed good thought transfermation transfusion of thought. And your running a couple of suitable song sequences from films is indeed good thought provoking suitables, as you very well enjoyed the very interview thoroughly. True expressions in will certainly be better if thought transmissions take place in one’s mother tongue. His idea of telugu parents talking with their own children in telugu is indeed necessary and indeed that in psychology we say proper cognitive imprinting, as you have necessary nuances of language command to transfer thoughts in proper expressions is indeed easier than labored thiughts transfers in borrowed languages.hence we call lingua franca. Akkineni’s thought on modern indians and a little arlier generations is indeed notable. He is sad with current Indian politicians. For your question as to how his children (sons) liked to enter film world is indeed not by his wish by wish of their own. And many thoughts shared by Akkineni with you are really showing his clear percptions of life. And when you asked about his marriage to his wife is by a love and he said beautifully the perceptions then prevailing that her parents trusted him to be a suitable partner to her, indeed timely. He is still looking \after her as a child as she is convalscing in a hospital due to some kidney relatedc problems shows how attached husband and wife combination is the thought modrn man has to emulate. WE WISH THAT LADY FAST RECOVERY AND WE ALL INDEED PRAY FOR IT. OUR BEST WISHES AND CONGRATULATIONS TO YOU FOR YOUR DEDICATED CARNATIC MUSIC WORK IN U S A PRATIMA,RAMAKRISHNA PENUMARTHY, AND PRATIMA’S PARENTS BALAKRISHNAN PANDIPEDDHI,NIRMALA PANDIPEDDHI FROM EASTON-BOSTON,MA. Thanks a lot for your encouraging comments sir! 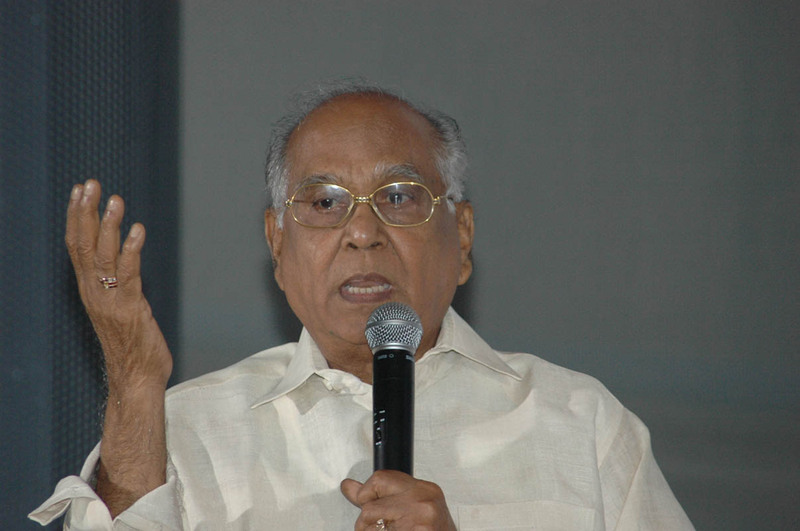 I totally agree with you about the views expressed by ANR garu about Telugu speaking with their kids! It is our Mother Tongue, we should talk in our Mother Tongue with our kids since they are very young, make it a rule that once they come home they should speak Telugu and speak English only when and where it is necessary as ANR garu said. Thanks for listening with the whole family and listeners like you make me do these kind of programs. Wonderful, hope we can expect some typical ANR type satires in this interview. Eagerly waiting for this one. Thank You Mohan garu, for posting the info about the interview of ANR garu. I’m Thankful to you for giving me this program 3yrs ago without which I never could have done anything like this. You are welcome Durga garu. Thanks for doing the show.